After reading GnTD listing the contents of his outdoor pockets, I�m inspired to share my own outdoor necessities. These aren�t the gear that is specific to any one thing (my kid�s bike helmet, for example) but general outdoor gear that I�d want to have with me no matter what we are doing. First is a bag. We�ve got a sort of bag addiction problem in my house, but that aside, my personal transportation solution is something I got returning home from our honeymoon: A messenger bag from Bailey Works in New Hampshire. I actually have two in sizes that they don’t make any more. What can I say? They’re still like brand new. I once cut a slice in the lining of the big one with a box cutter (I was cutting a cardboard box and didn’t stop in time). It made me mad, but it has never grown. The plastic snap fasteners are broken on the other, but somehow they still work. But the canvas they’re made from? Indestructible. As GnTD mentioned, much to my outdoor-cred chagrin, if I’m getting my daughter outside and she’s playing by herself, there’s a pretty good chance my cellphone is out. Either, I’ll be deleting pictures I’ve taken for no memorable reason, or text messages. Or I’ll be using its camera. It doesn’t matter what kind of phone it is�and you know I’m right. Forget about the calling capability�I don’t know how I ever lived without having a “camera” with me at all times. Truly an under-discussed outdoor parental essential. Another must-have for me is shoes with some sort of traction. Don’t know about you, but no matter what I say, I always seem to find myself climbing on rocks, or walls, or playgrounds. Or just chasing after my kid to keep her safe. And whenever I’m caught in flip-flops, or their ilk, I’m usually sorry. 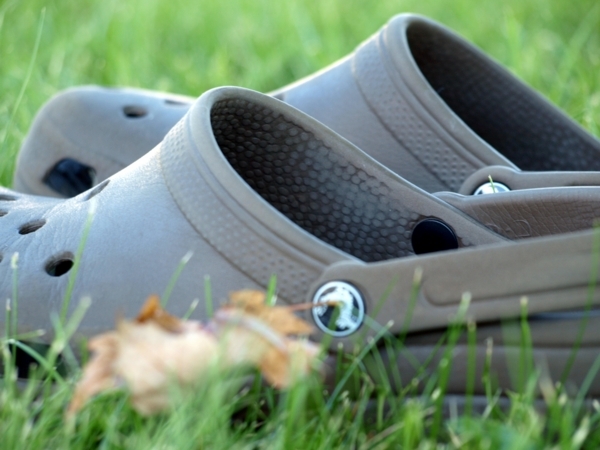 Running shoes, or Crocs, are my two best bets. The latter are floppy, yes, but at least you can run in them. And their all-terrain (i.e. water) ability is something running shoes can’t match. Finally, along these overlooked lines, I think that as a father trying to take my kid outdoors, one of the most indispensable items is a rugged watch. For years, I had Timex Ironman digitals, and this time around, I tried getting a Casio. Almost instantly, it was scratched across the crystal. Why? Because unlike the nearly-perfect Ironman, Casio makes the crystal higher than the surrounding plastic. The watch is important because we don’t all have time to spend endless hours outside. Instead, we often fit it into our lives when we can. But we don’t want our child to know the time outside is being, well, “timed,” in a sense. In my case, it was that we had to pick Mom up at her work. But of course we all have our appointments. These are a few of the things I find indispensable. I’d add a book, but I’m such a focused reader (that’s a bad thing, not a little self-congratulating pat on the back) that I can’t really trust myself to pay close enough attention to “watch” the kid and read. But if you can, that’s a sure thing needs-to-be-in-the-bag item, too. What are the things YOU need outdoors?